Starting your first vegetable garden can be intimidating at first. But fear not, we’re here to guide you and make it as easy as possible. The most important thing to remember is to start small, don’t overwhelm yourself with a large space at first. LOCATION, LOCATION, LOCATION – pick a spot that is close to where you spend most of your time in your home. If your garden is not in view or “far away,” you won’t be as inclined to remember to care for it. Make it easy and convenient, put your garden practically under your nose! SUN – You need at least 6 to 8 hours of sun. If your not sure how much sun you have, here’s a sun calculator. CONTAINER – Start with a pot or a raised bed so you can control your soil and you know it’s good. BE ARMED – At some point, you’re most likely going to run into problems. Be armed and ready rather than getting hit with a fungus and having to worry about fitting in the time to get the proper organic solution. We’ve created kits for you so you don’t have to think. Or, if you want to customize your own starter kit, just email us with your needs and we’ll create one just for you! 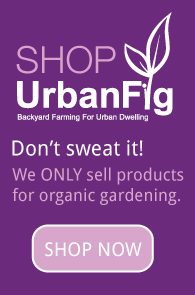 If you would like to add a raised bed, email me at info@urbanfig.com. We’re have new cedar beds that we customize for you and have it shipped right to your house (shipping is free). If you’d like to give our packages as a holiday gift, please order by December 15th.